An early-morning walk through the Chapel Hill Merritt Pasture near the James Taylor Bridge is a real pleasure. The wild part is gaining access to the rolling pasture site. You are well advised to plan your visit during the Sunday morning hours. There is a little parking available along the bikeway at the intersection of Culbreth Road and Highway 15-501. It’s a challenging intersection to negotiate on foot, even with the traffic light, and though Sunday morning is light, please remain constantly alert to the speeding vehicles until you have safely made it to the pasture. Eventually the town will have the planned parking and pedestrian safety measures in place so that access to Merritt Pasture will not be such a wild experience. And wow, once in the pasture, thanks to town efforts, you will have a real “meadow” experience. Several years ago, Chapel Hill added to staff responsibilities by making a commitment to managing the Merritt open space to provide habitat for butterflies and other wildlife. Observant citizens had described the healthy population of Common Milkweed there and a few folks began monitoring butterfly activity associated with those milkweeds. 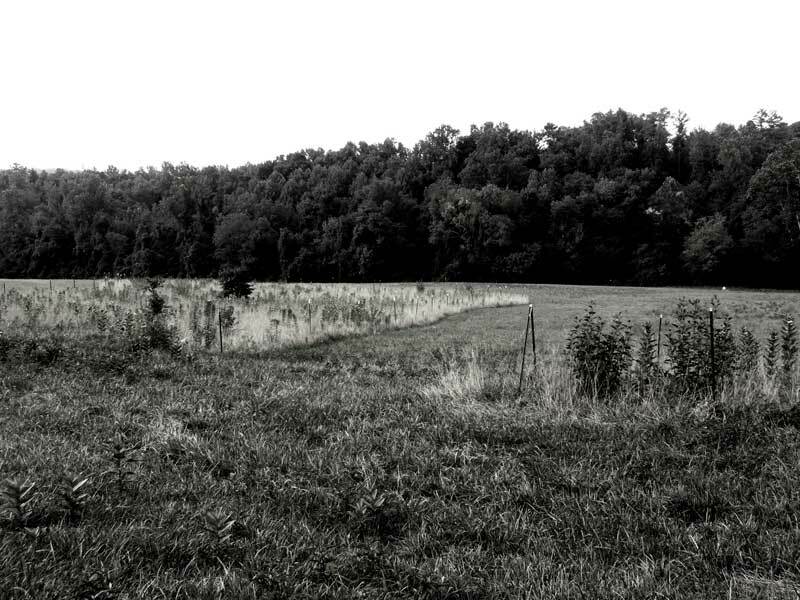 Except for a general winter mowing of the whole pasture to prevent the occurrence of forest, separate areas have been staked to protect the milkweed populations during spring and fall haying of portions of the field. Walking through the meadow one recent Sunday morning was a real adventure of discovery. There were a couple of Monarchs fluttering about. There were hundreds and hundreds of milkweed stems ranging from two feet to six feet. Some were still in flower – and what a sweet fragrance there – and some were exhibiting those odd-shaped warty green capsules that in the fall will turn brown and split open to send plumed seeds aloft on fall breezes. 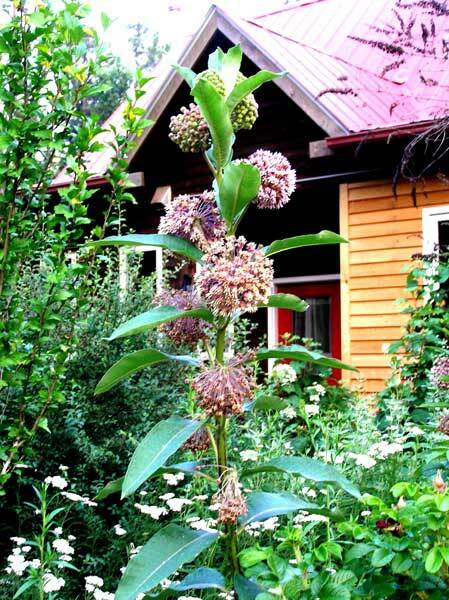 The Common Milkweed, Asclepias syriaca, is a handsome plant worthy of cultivating in the wild or a contained garden for its fragrance and visual appeal, as well as for attracting butterflies. Be aware, however, that, once established, the Common Milkweed will increase, freely moving about on its own by underground lateral stems. This is a plant for a carefree gardener, not one who keeps everything controlled and in line. I have enjoyed seeing them in gardens in the Carrboro Arcadia Co-housing Community and I have delighted in seeing them become established in that wonderful curbside garden outside Carolina Crafts Gallery. They must have become too aggressive there, however, for they were recently weeded out. I hope a few will come back. It was nice having that butterfly habitat in downtown Carrboro. Other surprises in the Merritt meadow that morning were orange-flowered Butterfly Weed, white-flowered Moth Mullein and the pale summer-green of lots of Broom Sedge, that common native grass that turns fields copper brown for the winter months. There is so much more to observe in that open hilly meadow. Do visit it some Sunday morning.